The Letter from Angels Adoption Campaign & photoshoot exhibition by Cho Sei Hon has come to an end after 15 years. Korean photographer Cho Sei Hon started shooting these celebrity photos in 2003 as means of promoting awareness and encouraging more adoptions. MJBHJH ~ A Better Tomorrow, indeed! Lee Min-Jung plans to reveal what it’s like to live with A-list actor Lee Byung-Hun for the first time on national TV! On November 18, SBS “My Little Old Boy” released a teaser for its upcoming episode, featuring actress Lee Min-Jung as a special guest. Because it’s a rare occasion that the actress shows herself in variety shows, the news gathered much attention from the public. Moreover, this is the first time Lee Min-Jung will openly talk about her married life with Lee Byung-Hun since their wedding in 2013. Since then, the two had done no promotions aside from dramas and films, and much curiosity had occurred regarding their lives as a couple. With her first comeback drama in two years ahead, Lee Min-Jung decided to appear on the show. During the teaser, the actress also mentioned her 4-year old son Jun-Hoo. According to her, whenever Jun-Hoo is asked about his father, he replies “my father is Eugene Choi.” It was the name of Lee Byung-Hun’s character in tvN drama “Mr. Sunshine,” which recently ended with much praise from the public. Furthermore, when Shin Dong-Yeop mentioned Lee Byung-Hun’s proposal at the wedding, Lee Min-Jung withdrew much laughter from others by saying, “it was so obvious. I knew it was going to happen.” At the end, the actress sent a special message to her husband and asked him to appear on the show himself and generated much buzz around the community. The upcoming episode of SBS “My Little Old Boy” with Lee Min-Jung will air on November 25 at 9 PM, KST. On the November 25 episode of SBS’s “My Ugly Duckling,” Lee Min Jung appeared as a special MC. During the show, she talked about her husband, actor Lee Byung Hun, and Shin Dong Yup asked whether she had ever been rudely awakened from her ideals of married life by a real-life situation. On the latest episode of SBS’s “My Ugly Duckling,” actress Lee Min Jung talked about her family life with her famous husband Lee Byung Hun and their adorable son. Lee Min Jung made a guest appearance as a special MC on the November 25 broadcast of the reality show, and the hosts and panelists were eager to hear about her marriage. During a discussion about planning romantic surprises, Lee Min Jung mentioned that Lee Byung Hun had been “way too obvious” about his proposal back in the day. “The third time he said that, I knew there had to be something at the end of the movie,” she laughed. Lee Min-jung appeared as the special guest of the SBS TV show "My Ugly Duckling" on the 25th. Lee Min-jung and Lee Byung-hun have been married for 6 years and they have a 4 year-old son. Lee Min-jung said, "My son is beautiful. Our family smiles a lot because of him. We recently moved out and my mother-in-law comes often to see her grandson. She loves him more because she waited for a grandson for so long". According to Sin Dong-yup, Lee Byung-hun's best friend, Lee Min-jung, is a great cook. Seo Jang-hoon said, "You don't seem like the type to cook so this is unexpected", and Lee Min-jung said, "I have to cook to be able to survive". She picked out a few of her best dishes as gochujang stew and chicken stew. She said she learned the recipes from the internet. Lee Min-jung was asked if she and her husband have shown each other everything, including going to the bathroom and she said, "Almost". Then she claimed there was once when she was upset at her husband. She said, "I eat slowly, but my husband finishes eating even before I've set the table. Eating quickly on set has become a habit for him. I was shocked". "We were only just married then so I told him. Now he tries to eat slowly and thinks of me". She added that she makes him breakfast every now and then when she's not at work. The married life of A-list actors Lee Byung-hun and Lee Min-jung has been mostly concealed. However, the actress leaked some parts of it on SBS variety show "My Little Old Boy" on Sunday, allowing a glimpse into the couple's private life. The actress, appearing as a special host, was dubbed "Mrs. Sunshine" after her husband recently starred in tvN's hit drama "Mr. Sunshine," about the people who had fought to maintain the Joseon Kingdom's independence. As she observed the lifestyles of the show's cast, the actress also opened up about her own life. "My husband and I can fart and burp in front of each other almost any time," said Lee, showing how comfortable the two are with each other. She also revealed that she was sad during her honeymoon because her husband ate too quickly, despite her being a slow-eater. She said he finished eating even before she had finished serving. She said Lee Byung-hun slowed down after she told him what she felt. The actress talked about her son as well. "My son mostly resembles his father, but his eyes look like mine," she said. "He calls his father 'Eugene Choi.'" This is the name of a character Lee Byung-hun played on "Mr. Sunshine." The actress and the actor married in 2013, and she gave birth to a son in 2015. Lee Byung-hun was embroiled in a cheating scandal with a former girl group member in 2014. The actress will star in the forthcoming SBS drama "Fate and Fury" with actor Joo Sang-wook and So E-hyun. 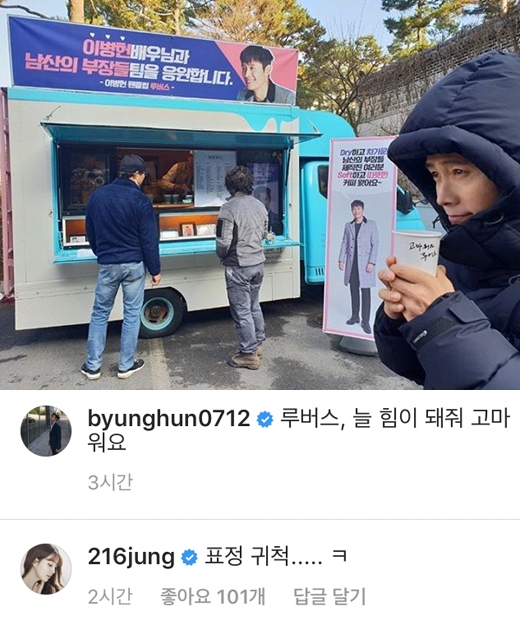 Minjung sharing about the proposal prepared by Byunghun..
Byunghun posted a photo on his IG on 11/28 thanking his fan club members for the coffee truck & snack treats sent to the filming of his new movie, Chiefs of Namsan. She wrote: (You are) trying to look cute! Lee Byung Hun was given the highest award for actors at the 2018 Asia Artist Awards. At the November 28 ceremony, the actor received four trophies in total, including the Daesang (grand prize) for actors, one of 10 Artist of the Year awards for actors, a Fabulous Award, and the Korean Tourism Appreciation Award. He went on to say, “This is the first time in my life that I’ve received this many awards, and I wonder if I deserve it.” He also congratulated his “Mr. Sunshine” co-star Yoo Yeon Seok on his awards, and shared the honor of his Daesang with his co-stars. The Daesang in the artists category at the 2018 Asia Artist Awards went to BTS. You can check out a full list of the night’s winners here. Artist Awards (AAAs), held on Wednesday at the Namdong Gymnasium in Incheon. Lee and the group also received the Appreciation Award by the Korea Tourism Organization for promoting Korean tourism abroad. During the press event of Minjung's new drama (Fate & Fury, starting December 1), the actress mentioned her hubby. Good thing that he decided to skip the MMA today.. the duration of AAA already covered 3 awards shows in a row. LMJ said because BH is filming a movie, and his schedule is different(relatively more time) so he is in charge of their son. And she's thankful for that. Oh this is a much more serious role than her previous ones, this makes me even more excited to watch since she's taking on a new type of character. Mommy.. the boys are planning something..